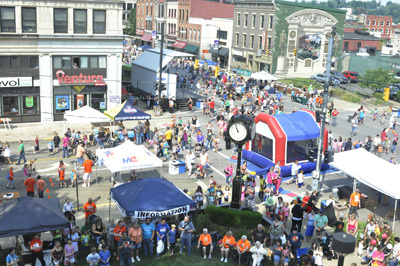 Fun Fest is a FREE, annual event held as a part of Massillon's Summer Celebration! Want to get involved? Organizations & Businesses Sign up online! Non-profit Organizations and Downtown Massillon Businesses are invited to set up booths at this event for NO CHARGE, as long as a FREE or NEARLY FREE youth activity is provided. Your business can also sponsor a special activity or performance for Fun Fest 2018. We will be using our online registration process. Click here to sign up online! The deadline for organizations to sign up is July 27, 2018. For more information contact Liz Gessner McAllister at 330-833-6655 or email her. Free admission. There is no cost for most activities; some have a minimal charge. Games, story times, prizes, face painting, contests, art projects, dancing, crafts, health and safety activities, athletic events, and music. The Massillon Public Library Bookmobile and a children’s book sale will be on hand. Children can meet the Stark County tourism mascot, Pigskin, and the U.S. Coast Guard character, Coastie. The day will be filled with hands-on experiences: sand art, beaded and edible jewelry, fossils, inflatables, remote control cars, balloon crafts, wooden projects, spirit masks, mining for gemstones, flower arranging, Little Tykes riding, and a preschool sensory experience. There will be carnival games, running drills, corn hole, spray hair color and temporary tattoos, build-your-own trail mix, face painting, and a petting zoo. Among the health and safety booths will be spinal screening, dental screening, and seat belt safety. Children will get to spin the Atkinson Feucht Hare school supply wheel, where everyone wins. Admission to the family-focused event is free. There is no cost for most activities; some have a minimal charge. Social service agencies, civic groups, churches, arts organizations, and businesses set up dozens of games, art projects, activities, and information stations. Families love free take-away items—coloring books, pencils, balloons, banks, bookmarks, and puzzles. Fun Fest is intended to provide all the fun of a festival with a focus on meaningful activities. Many of the organizations and businesses provide valuable health, safety, and educational information to parents while entertaining the children. MCTV, Downtown Massillon Association, the City of Massillon, Rotary Club of Massillon, and Midwest Industries. Silver sponsors: Farmers National Bank, Amherst Meadows, Advanced Industrial Roofing, Home Appliance, and Danbury Senior Living. 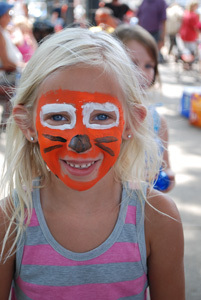 Fun Fest is centered on First Street and Lincoln Way East and on the lawn of the Massillon Museum. On the same day, the Lincoln Highway Buy-Way—a yard sale all across Ohio along the historic route—will also enliven downtown Massillon on August 12 closer to the viaduct. St. Timothy's Church will host a Tool Time sale—tools, exercise and sports equipment, working electronics, and garden equipment.